Thanks to my pals at Post for sharing this recipe! To celebrate this day in flavorful style, I have a great recipe that is filled with nutritious ingredients like Post Great Grains cereal that you won't want to miss! 2. Beat eggs, milk, sugar, vanilla and salt in large shallow dish with wire whisk until well blended; set aside. Place cereal in resealable plastic bag; seal bag. Crush cereal with rolling pin. Dip both sides of the bread slices in egg mixture; place on clean work surface. Sprinkle evenly with chocolate; top with bananas. Dip both sides of remaining 4 bread slices in remaining egg mixture; place over bananas to make four sandwiches. Press together gently. Coat both sides of sandwiches with cereal crumbs; press crumbs firmly into sandwiches to secure. 3. Place on baking sheet. 4. Bake 20 to 25 min. or until lightly browned. Cut diagonally in half. Serve with the strawberries. Substitute: Prepare as directed, using semi-sweet baking chocolate. omg drooling so much i might drown! 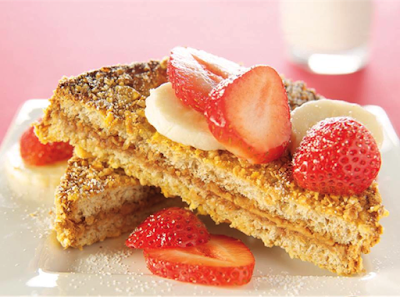 love french toast and to have it with chocolate and fresh fruit?!?!? nom nom nom! This looks really yummy. Thanks for linking up with Small Victories Link up. This recipe looks wonderful. I've used Portuguese or Hawaiian sweet bread before and its added a depth to the french toast. Sara, I’m sure you have planned make me hungry, right?? My mouth is watering right now! Yum, we love french toast any way we can get it. This looks like a delicious variation. Thanks for sharing with Small Victories Sunday Linkup. Pinning to our linkup board and hope you found some great posts to visit this week!